Children are set to embark on a journey of discovery and adventure at a ground-breaking new Fort Douglas playground designed and built by Blue Forest at Dalkeith Country Park in Scotland. The magical park, which could have been plucked straight from the dreams of big kids and tiny tots alike, is part of a £4m redevelopment programme at Dalkeith. The Fort Douglas playground is enjoyed by locals who treasured Dalkeith’s previous play area for generations, but also attracts visitors from across Scotland and beyond with its unique design and creative play features. The 1,000 sqm adventure park aims to capture the imaginations of youngsters who love to explore, discover and play make-believe, with a host of exciting features designed to add inspiration to their playtime. The centrepiece of the Fort Douglas playground is The Look-Out Treehouse, a spectacular hideaway with a mysterious, whimsical theme. Featuring a turreted roof with a maze of fanciful rooms and tunnels to explore, kids can navigate their way through the wooden wonderland to an impressive look-out platform at the top. 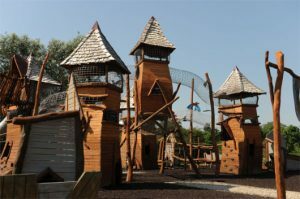 An adventure zone for older children incorporates a network of exciting high-rise walkways, balance blocks, log walks, jungle climbers, jumping discs, swings and slides. The new adventure park also includes a toddler area featuring a fun wooden carved duck family, miniature train and a smaller treehouse-style den. Access to the Fort Douglas playground is via an entrance bridge with a special ‘children only’ feature – a kid-sized mesh tunnel runs from one side of the structure, disappears underneath it, and re-joins the bridge on the other side – its a thrilling experience to sit suspended above the river with the water running and splashing below you. 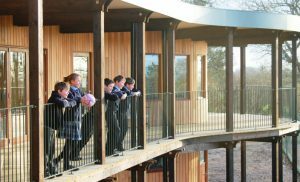 Due to growth in pupil numbers, Cranleigh School identified the need to develop additional facilities for the Preparatory School. 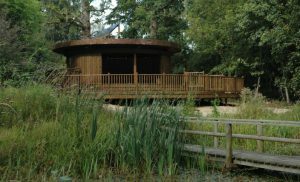 Set within the grounds of Benenden School in Kent, this ground-breaking eco-classroom provides an innovative teaching space surrounded by mature parkland and woodland.